It would be hard to think of a bird exhibiting more cunning, speed, and raw savagery than the crow-sized Cooper’s hawk. Equally at home in wilderness forest and suburban hedgerow, the highly maneuverable Cooper’s is perhaps best known for its surprise attacks on backyard bird feeders — raids that usually result in an unfortunate dove, cardinal, or blue jay becoming a fast food menu item. It’s an ongoing drama that flares tempers and raises the blood pressure of bird feeding Grandmas everywhere. I have a love-hate relationship with the Cooper’s hawk. Which direction the pendulum will swing largely depends on our latest contact. 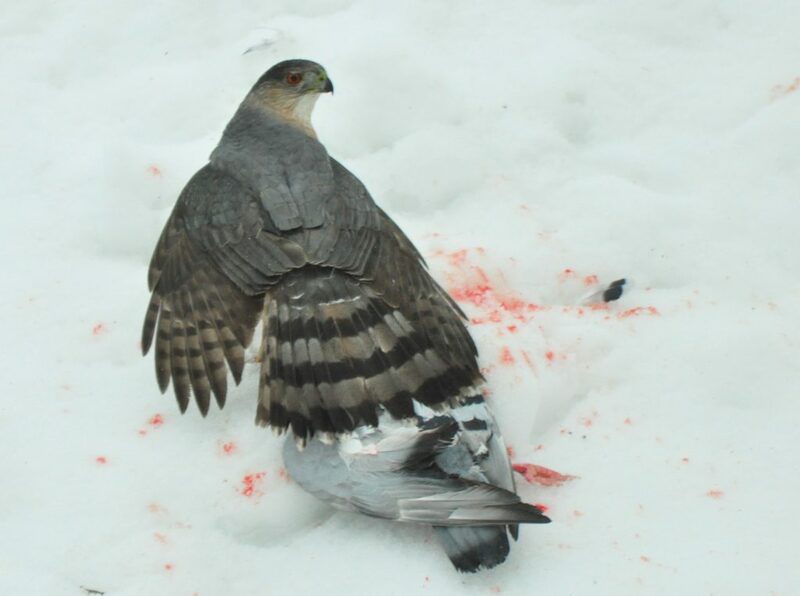 Whenever a Cooper’s comes blistering through our yard and deftly snags a fleeing sparrow or junco, I think, “Wow, that was awesome!” But when the same hawk comes in and kills one of my pet homing pigeons, I want to scream. 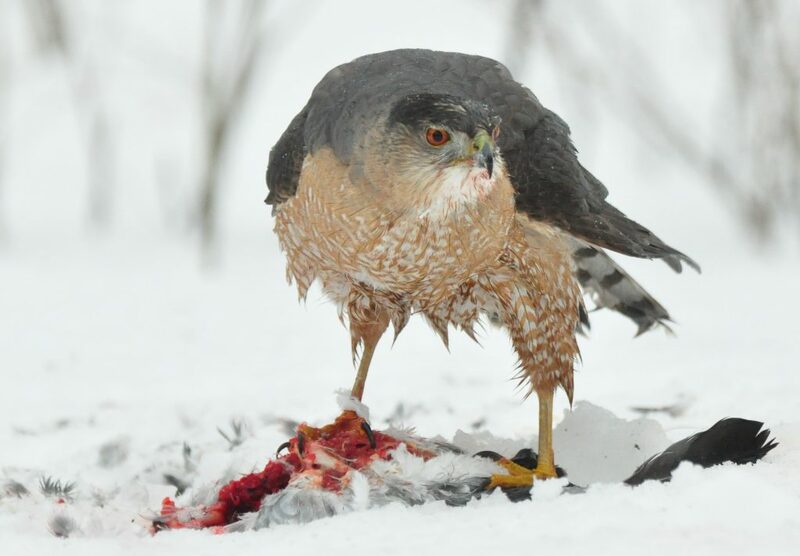 I fully realize, of course, that it is as perfectly natural for a Cooper’s hawk to eat a pigeon as it is for it to chow down on some hapless starling. Chasing, catching, and consuming other birds is pretty much what Cooper’s do. It’s how they make their living and there is no rational way to hate them for doing so. Whenever a person puts out feeders full of choice seed, they are inviting wild birds to visit their backyard. The more feeders you hang, the more birds you attract. That’s called success. 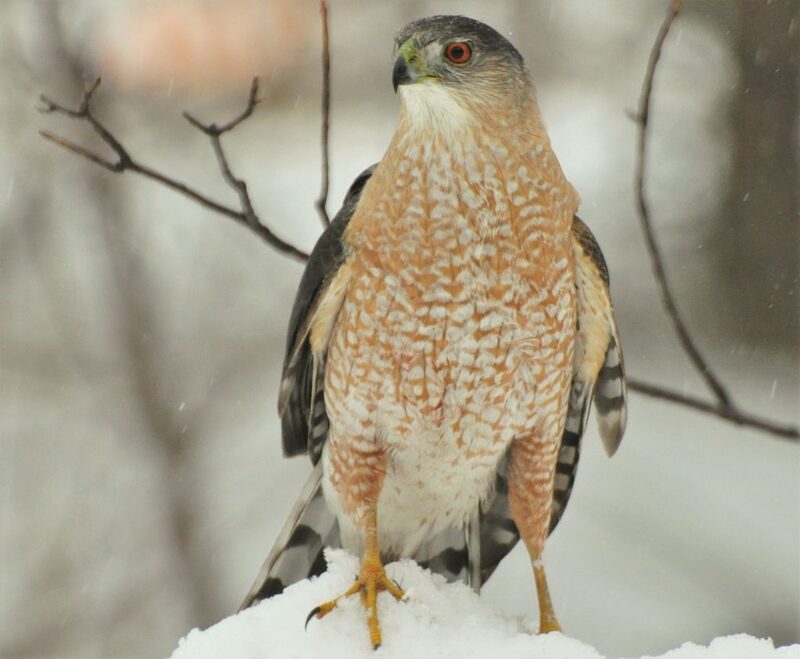 When a passing Cooper’s hawk notices all that feathered backyard activity, it capitalizes by joining the buffet. It’s a natural progression. Sunflower and suet feeders attract hungry finches, sparrows, and woodpeckers. Finches, sparrows, and woodpeckers attract hungry hawks. That’s also a sign of success. Like it or not, marauding hawks are simply taking bird feeding to its next highest level. I love homing pigeons. They provided civilization with its earliest form of air mail, and humans have long marveled at the homer’s uncanny ability to find its way home over miles of unknown terrain. I’ve been raising and flying pigeons since I was nine-years-old. Surrounded by bird feeders, my backyard pigeon loft is currently situated at the edge of a mature woodlot. No wonder I have losses. If my loft isn’t a begging-for-trouble, hawk feeder on steroids, I don’t know what is. 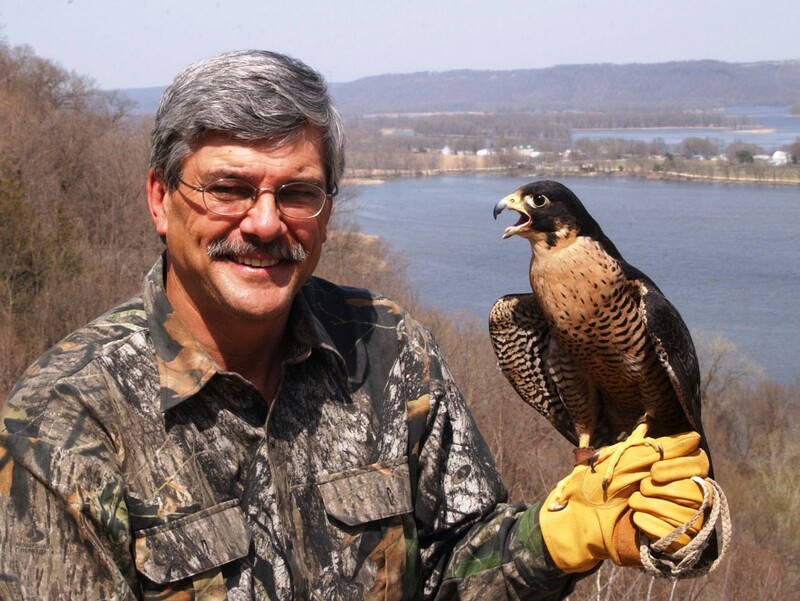 Thirty years ago, Cooper’s hawks were listed as an endangered species in Iowa. Losing a pigeon to one was rare; almost something to brag about. But the scenario has changed. Cooper’s populations are on the rise and visits to my loft have become dramatically more common. The annual loss of homers has become alarming; nearly sixty were killed during my worst year. Needless to say, the novelty has worn off. Some losses are easily forgotten. Others are more painful. Like the three homers killed by Cooper’s hawks after returning from flying a course that originated in the western Black Hills, carried them over the Dakota badlands, across wind-swept prairies and sweltering Iowa cornfields. Losing those birds hurt. Even more painful was the loss of a blue-barred homer who had recently returned from a grueling, 1,000-mile race that began at its release point in Houston, Texas and terminated – in more ways than one — at my loft in Clear Lake. Not exactly the kind of homecoming we had anticipated. When leaving the house Saturday morning, I discovered a Cooper’s hawk consuming one of my homers at the edge of my driveway. When I returned home a bit later, a Cooper’s was eating another pigeon atop a melting, front yard snowdrift. Making the most of an unwanted situation, I attempted to get a couple photos of the raptor with its prey. Although Cooper’s are notoriously high strung and extremely difficult to approach, this hawk – an adult male — was decidedly different and allowed me to creep to within a few feet. Hard to explain the bird’s unusually tame behavior. It seemed clear that the hawk wasn’t injured and was in obvious good health. One possibility was that the hawk may have been raised in some remote forest where having had no previous contact with humans, viewed me as more of a curiosity than as any serious threat. Or it might have been one of an increasing number of Cooper’s hawks being raised in suburban, rather than wilderness forest, environments – hawks that have near daily exposure to the sights and sounds of people, cars, and lawn mowers. One fact is certain. With a shrew-like metabolism, migrating Cooper’s hawks are in a perpetual state of refueling; constantly hunting and consuming other birds. And although I wasn’t happy for my loss, it would be foolish to hold a grudge against a hawk that had merely accomplished what it is naturally programed to do. But now that I’ve contributed a full tank of gas to its future livelihood, I also hope that the visiting Cooper’s doesn’t waste any more time in continuing his migration.